Over the weekend I learned of a few unsuspecting (at least to me anyway) new backers of the green initiative, which for this post, I'm dubbing "Green-backs". 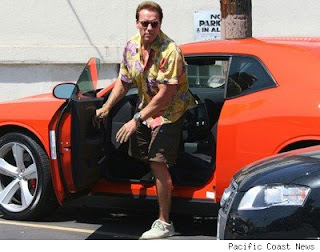 The first Green-back is California Governor Arnold Schwarzenegger, and his purchase of a Tesla. Not so surprising being that he has the responsibility to set the tone for the initiative in "Cal-e-for-knee-a" as he pronounces it, and not so much because of his background in bodybuilding and the movies as a tough guy action hero, but because of his previous choices in automobiles like HUMMERs (several), and being spotted in a 6.1L V8 Dodge Challenger SRT-8 as early as this weekend. He also has his own jet. "Diesel cars are the norm in Europe, but in the U.S. they still hold the stigma of being loud, sluggish, and stinky. The E320 Bluetec will make you a diesel convert, however. It's quiet, clean, and powerful, and has a hybridlike fuel economy. A full tank will take you almost 700 miles." Couldn't have said it better myself. Maybe you'll see the LM prototype in a follow up article in the pages of GQ in the near future.